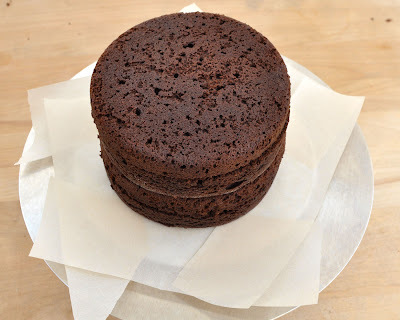 Prepare two 6" round chocolate cakes using my Rich Chocolate Cake recipe. *Note: You will only use 2 cups of batter for each 6”x 2” layer. So you will likely have some batter left over. I use that to make some cupcakes or mini-cupcakes and stick those in the freezer for a chocolate emergency. Ganache is the rich chocolate filling you find inside amazing truffles and other fine chocolates. It’s also a beautiful and tasty frosting for a cake. 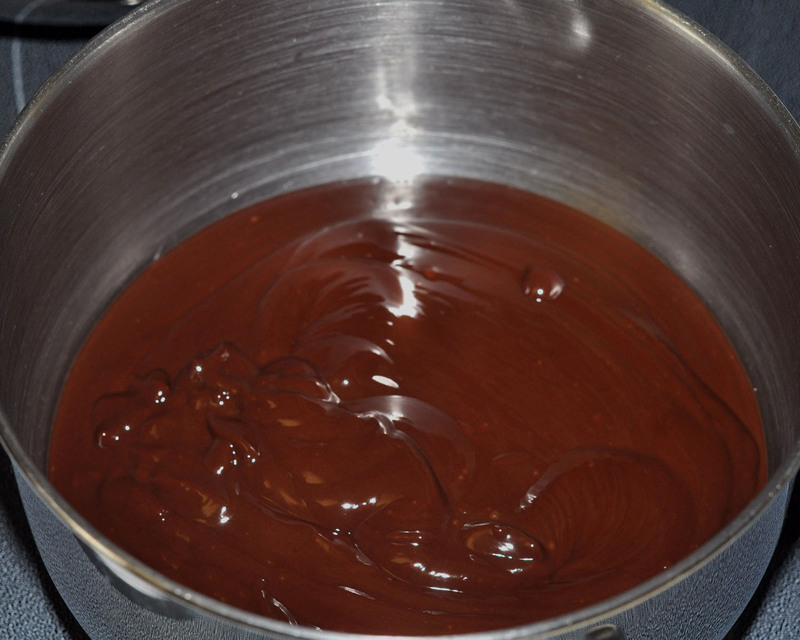 Place one cup of ganache into a small bowl. This will be your filling. 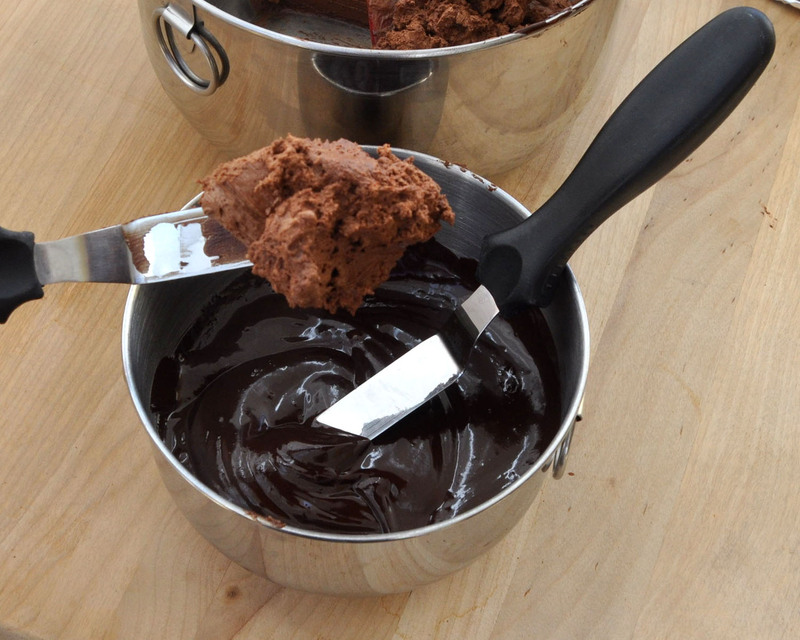 The remaining bowl of ganache is your frosting. 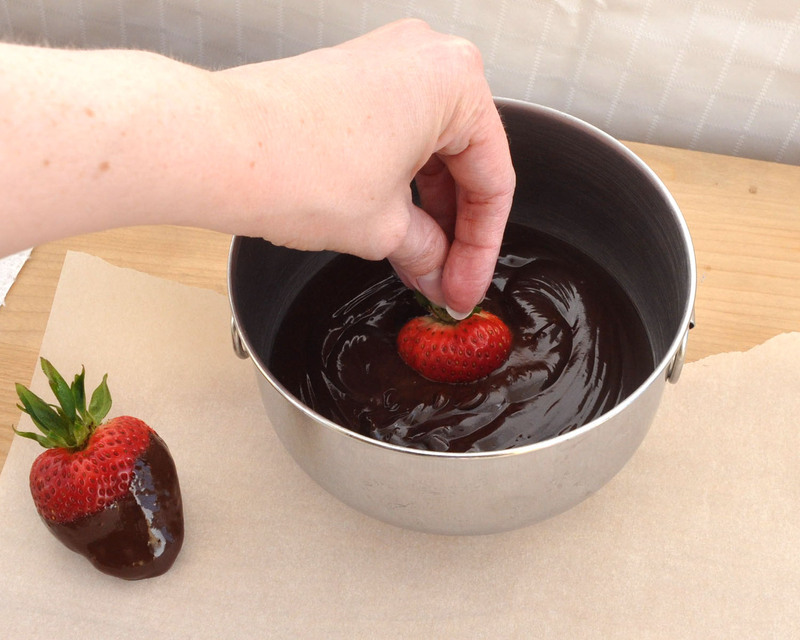 Immediately after dividing the ganache, dip the bottom ¾ of each of your strawberries in the frosting bowl. Set them on a piece of parchment paper to set. 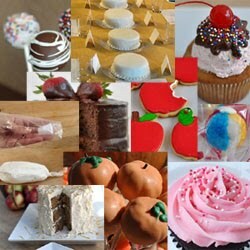 You may want to put them in the refrigerator while you work on the cake. 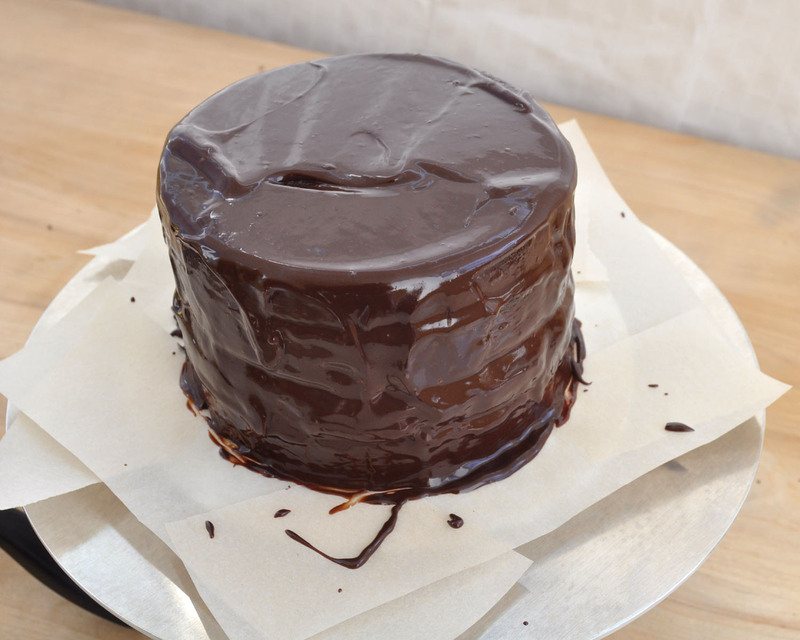 Leave the rest of the ganache on the countertop to cool slowly while you work on your filling. Place the smaller bowl of chocolate over an ice bath. 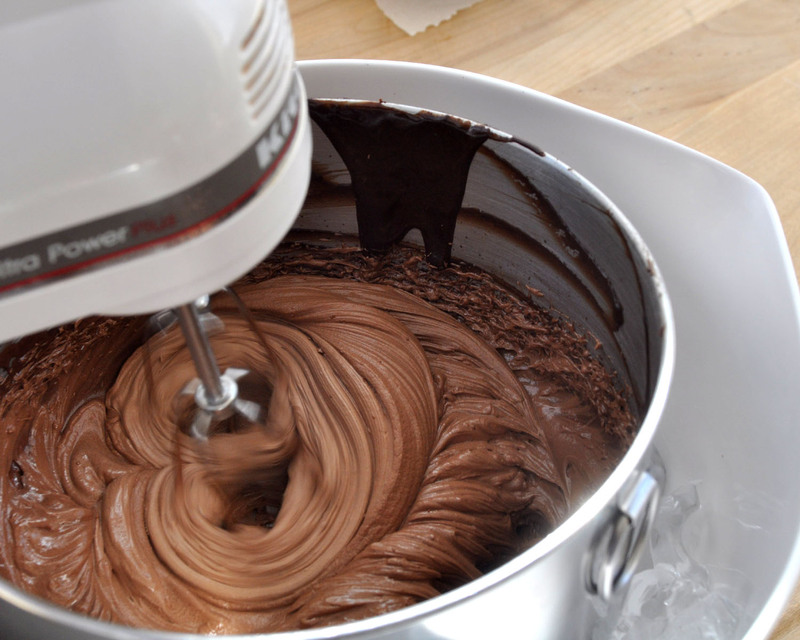 Whip the filling with a hand mixer, leaving the bowl over the ice bath while you mix. Whip on high power until soft peaks form, about 3 minutes. 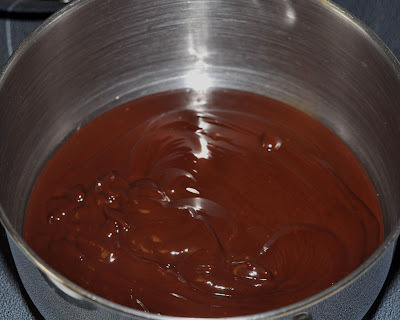 The chocolate will dramatically change color from a dark brown to a very light brown while you whip it. *Note: If you do not have a hand mixer, let the ganache cool in the refrigerator or an ice bath until it is a little thicker than pudding. Stir it frequently during cooling to avoid any chunky spots. Then you can use your stand mixer to whip it. If it does not begin to change color after about a minute of whipping, it is still too warm, and you need to let it cool a while longer. Be careful not to leave it for too long or it will get too stiff to whip. 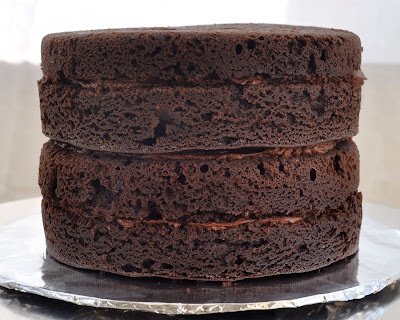 Level each cake by removing any dome from the top. Torte them—cut each in half—to create four layers. Set one of your four cake layers on the serving plate. Spread about 1/3 of the whipped filling on top of the bottom layer, leaving about 1/8-1/4 inch from the edge. Place next layer of cake on top. Repeat filling remaining layers, using 1/3 of filling for each layer. This is what your cake will look like before you add the icing. Yum! To keep the chocolate from dripping all over your serving plate, use about six 2 x 4-inch strips of parchment or waxed paper, tucked underneath the bottom edge of the cake. Be sure they’re overlapping so that the chocolate doesn’t sneak through. 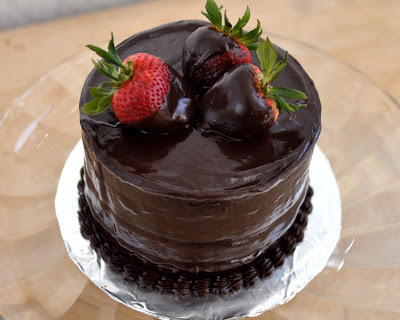 Covering the cake with ganache is probably the toughest part of making this cake. It’s important that you get your frosting to just the right consistency to make it easier to spread. 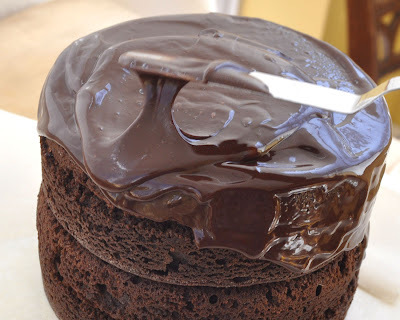 Depending on the temperature of your kitchen, it will take about 15-25 minutes at room temperature to get the ganache to the right spreading consistency. You want it to be about the consistency of thick pudding. 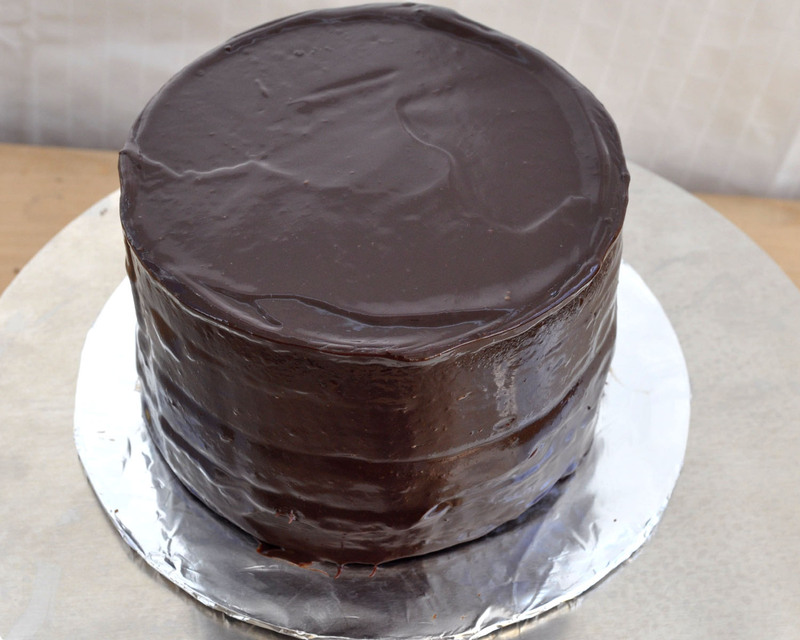 Pour a small amount (about one-fourth) of the cooled ganache frosting over the top of the cake. 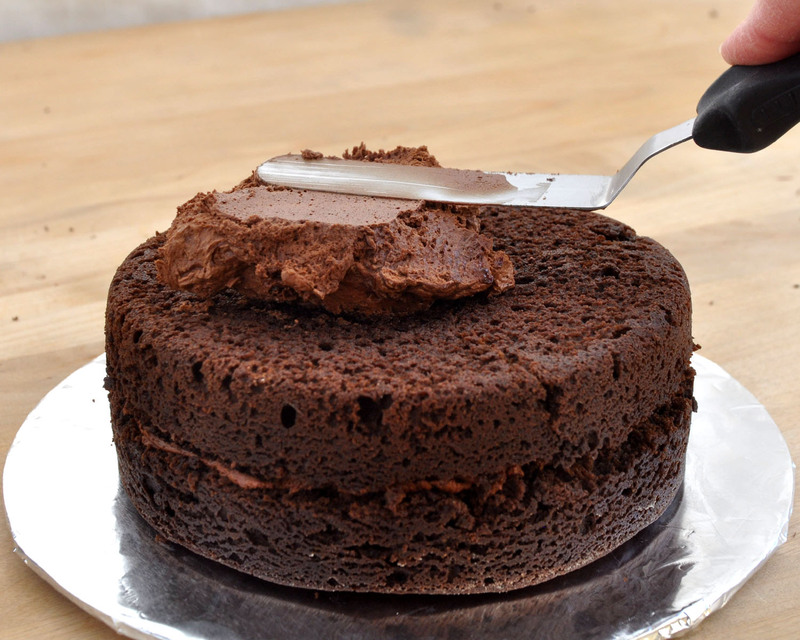 Using a small spatula, gently spread the frosting to cover the top of the cake. Try to keep most of this frosting on the top of the cake. To cover the sides, slowly pour more, maybe ¼ cup at a time, on the top of the cake. 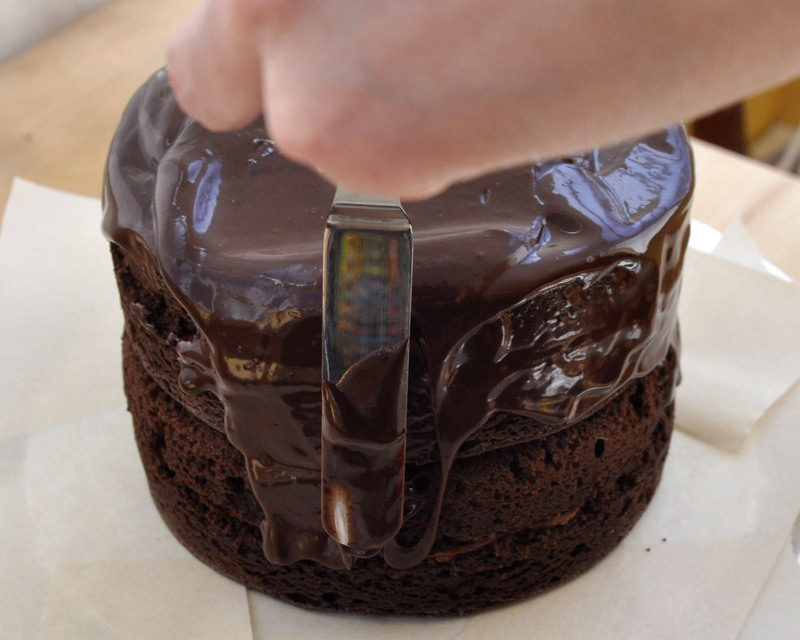 Slowly push that icing to the side until it begins to drip down the side of the cake. Using your spatula, gently spread the icing as it drips down the side. If you find that the icing will not stick and continues to run down the side into a large puddle at the bottom, it’s still too warm. Let it cool a while longer. When you get all of the sides covered, you’ll want to work to smooth the top and the sides. A turntable makes this job a whole lot easier. 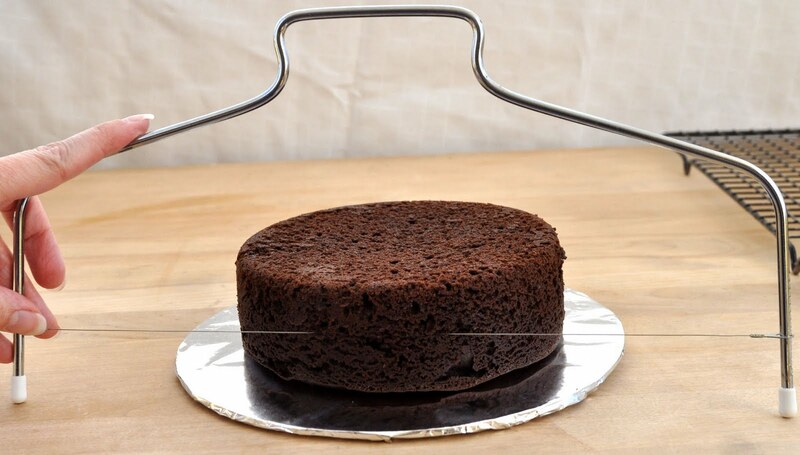 Using a turntable, set your spatula along the top of the cake, being careful that it is parallel with the top of the cake. Turn the cake one full turn and lightly pull away while the cake finishes spinning. 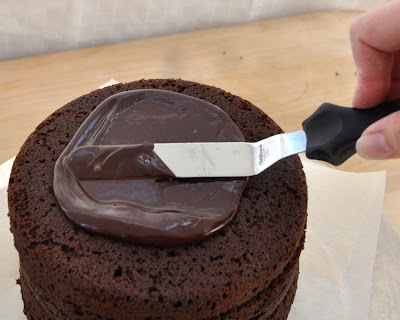 This will give you a soft, smooth spiral on top of the cake. To smooth the sides, set your spatula again parallel, this time with the side of the cake. 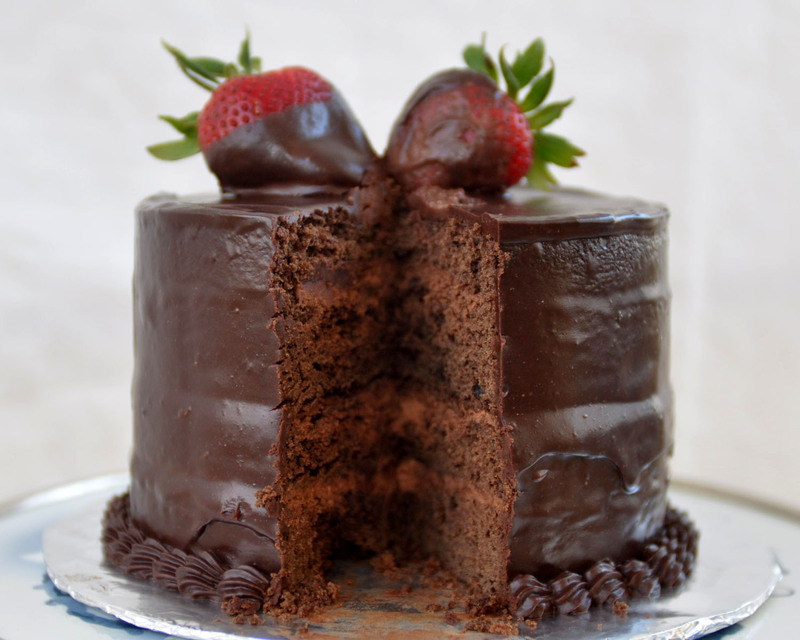 Be careful that it’s not angled out at the bottom of the cake. This time you’ll want to turn your turntable much more slowly, making sure to keep the spatula straight and in contact with the side of the cake. Be careful not to press too hard or you’ll end up stripping the icing right off. When you make a full rotation, gently pull the spatula off to the side. Do not pull straight away or you will have a line where you stopped spinning. When your cake is covered and smoothed to your liking, pour the remaining ganache into a piping bag fitted with a small star tip. (I like tip #18.) Place the bag in the refrigerator for at least 10-15 minutes or until the icing does not drip out of the tip when you hold it upright. To pipe a shell border along the bottom edge of the cake, you will want to hold your bag at a slight angle so that the tip of the bag is almost touching your serving plate, right at the edge of the cake, and so that the back of the bag is pointing at your chest. Lightly squeeze the bag until the icing begins to form a ball against the cake, push the tip back into the icing slightly (about 1/8-1/4 inch) to create the shell shape. Then slowly relax your hand while you pull the bag towards yourself. Repeat all the way around the cake. 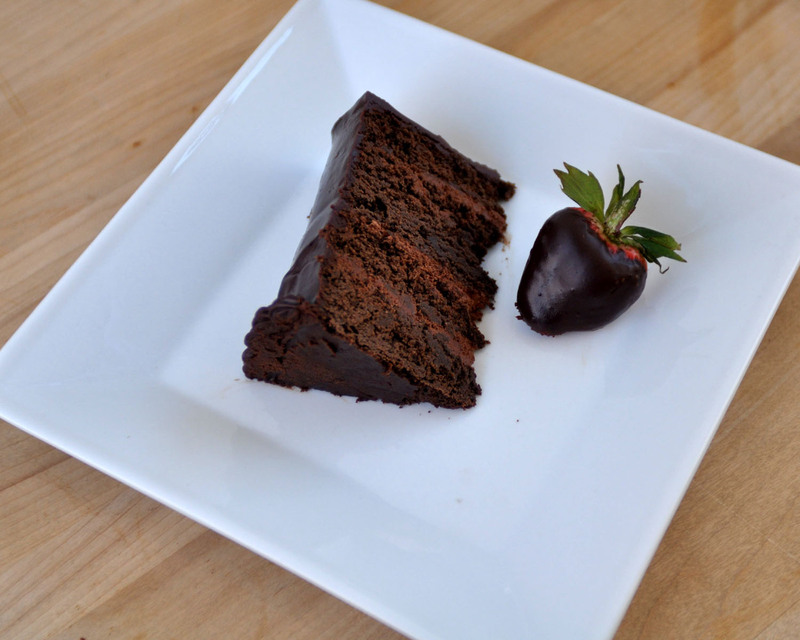 You’ll want to store the cake in the refrigerator, but bring it back to room temperature to serve.